(1) Magnetic Display Table, Black/White 12"x12"
This will quickly become your #1 go to lighting tent kit for your portable photography studio! 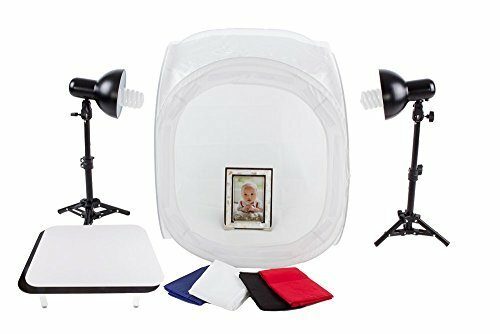 The StudioPRO 300W Photography Table Top Photo Studio Lighting Kit is the perfect two light kit for table top photography or small animation videos. Easily set up this kit in minutes! It is great for online sales markets or web retailers looking to shoot their products and ideal for online retailers and collectors for platforms like Etsy, eBay, and Amazon. Each tent comes with different color backgrounds of black, white, blue, and red. The box diffuses the light to prevent shadows and glare. The design allows objects to be lit from any angle and can be used with any lighting system. The reflective surface of the StudioPRO magnetic display table adds reflection of the product creating a unique look.